When sustainable, fire-engineered ventilation solutions are called for, Airocle’s 3 Series low profile high capacity continuous ridge roof ventilators give project designers and architects the natural options they need. Suitable for ridge mounting, the 3 Series roof vents incorporates patented one-piece guiding vanes and dampers, giving low profile and weight, as well as providing maximum exhaust flow. Modern, innovative and ‘green’ design makes for an unobtrusive appearance and economical outcome – without adding greatly to the wind or dead load on the building structure. Airocle’s 3 Series high capacity roof ventilators provide a positive means of extracting excess heat and fumes. They are especially suited for large-scale industrial projects. NB. For ventilators to meet statutory requirements of single storey projects with low to medium heat loads, 150 mm to 750 mm throat Airocle lowline continuous ridge ventilators are available. Contact Us for more information. Fully certified, full-scale testing combined with more than 80 years of product development and installations world-wide ensure optimal performance you can rely on. Manufactured to withstand high wind loads, when tested by an independent authorised laboratory to AS 2428.5, 3 Series ventilators averaged a minimum coefficient of discharge of 0.73. 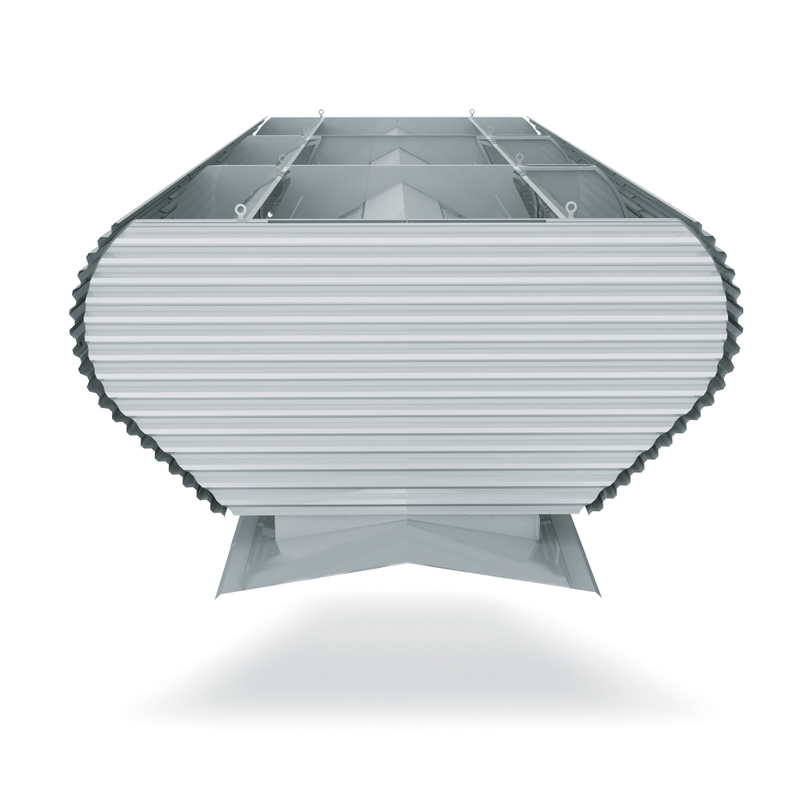 Airocle’s 3 Series vents are durable and innovatively designed to withstand harsh and fluctuating weather conditions. Ventilators are weather-tight and storm-proof under all positive operating conditions, and are capable of withstanding a wind load of 1725 Pa. Fixed to the supporting framework, wind-jump diaphragms are incorporated at regular intervals to ensure low pressure regions – required for optimal operation – are produced, even when natural wind flow does not allow for this. Virtually free of running costs and with minimum maintenance to worry about, Airocle’s 3 Series ventilators provide the perfect adaptable architectural ventilation solutions for a sustainable future. The 3 Series roof ventilators operate on the latest engineering developments designed to take maximum advantage of natural stack action – the product of temperature and height. Adequate inlets are essential for any ventilation scheme to operate effectively and should be provided to ensure replacement air can enter freely. Wind borne matter and rain are effectively carried to the outside of the ventilator by careful positioning of all openings and self-cleaning drains, which also ensure weather-tightness of the units. The 3 Series can be fitted with a range of options including bird wire, Ridgelite, acoustic dampening, operable dampers, weather sensors and automatic controls. For further information on these accessories simply contact us. Once installed, our ranges of natural ventilation systems are economical, requiring virtually no on-going maintenance costs. Due to the varying degree of corrosive environments found in industrial applications, Airocle can provide a range of quality protective coating systems to adequately protect ventilation components. For these applications Airocle offer a unique Vitrecoat system that has permanent flexibility, abrasion and corrosive resistance with a FRP system for highly corrosive environments. Available in Colorbond, Colour coated Zincalume, galvanised steel, aluminium or stainless steel (FRP).